The iPhone X sold out in minutes after preorders for the phone went live. Apple is reportedly having issues supplying enough phones to meet demand. Wall Street is still bullish though, and many think the company will bounce back next year. Follow the price of Apple’s stock in real time here. Apple’s stock price is rising after preorders for the iPhone X seem to indicate strong demand for the new phone. 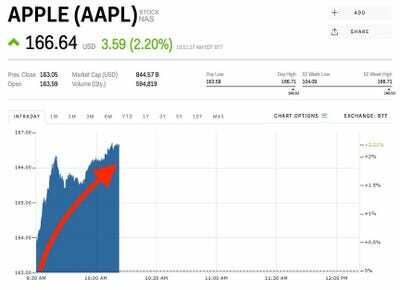 Shares of Apple are trading up 2.27% at an all-time high on Monday after the company’s iPhone X preorders sold out in mere minutes on Friday. Apple has been plagued by reports of parts manufacturing trouble and is expected to have only 2-3 million phones ready for launch day on November 3. Some Wall Street analysts think that while the supply constraints are real, they are only temporary. “Simplistically, whatever Apple guides for Dec-qtr is a reflection of their supply and not true end-demand, hence we see potential for Dec-qtr guide being below street but we see upside to march-qtr expectations as supply eventually catches up,” Amit Daryanani, an analyst at RBC Capital Markets, said in a note to clients on Monday. Daryanani said he expects Apple to sell almost every iPhone X it can make in the current quarter because it won’t be able to keep up with demand. As parts manufacturers ramp up production in the coming quarter, however, the company will be able to meet demand in the first quarter of 2018, he says. Lower volumes will be offset by a higher average selling price in the short term before sales volumes will rebound in later quarters, Daryanani said. Daryanani rates Apple a “buy” with a price target of $US180, about 8.4% higher than its current price. He thinks Apple will sell 75 million to 80 million iPhones in the December quarter, with total revenues at more than $US80 billion. Other analysts are even more bullish. Brian White of Drexel Hamilton rates Apple a “buy” with a price target of $US208, about 25% higher than the company’s current price. “We believe sentiment around this iPhone cycle is turning positive and we expect the momentum to continue,” White said. Apple is up 43% this year. 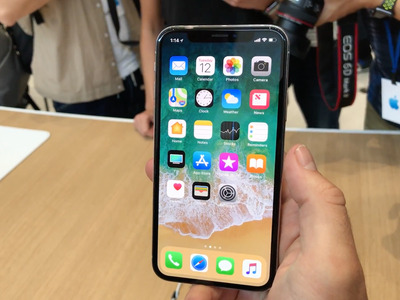 Read more about the iPhone X demand here.